Make the Boot Camp work for you, right now! Sign up for the next four-day Boot Camps today. 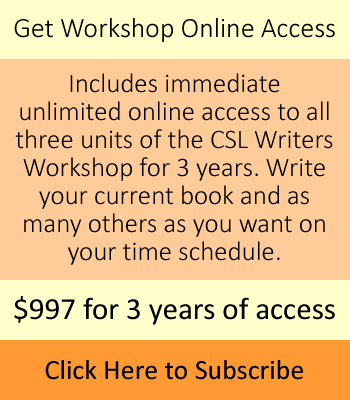 Experience the CSL Writers Workshop Instant Preview! Click the link below to download the preview workshop template (required for the writing exercises), set aside an hour-and-a-half, and click the play button on the video. Watch the video, write in the template when we tell you to do so, and watch your book idea focus and organize itself. Now you know how the CSL Writers Workshop compels you to write your book. Identify your expertise and the problem you solve. Identify the critical first step that will make your book sell like hotcakes! Choose your subject, create your title, and outline your book. Write your book during class sessions using our unique book template. Learn how professional writers create an emotional connection with the reader through stories.